Our Mother of Confidence The Mass Video Series by Bishop Robert Barron – Free Event! Our Mother of Confidence > The Mass Video Series by Bishop Robert Barron – Free Event! 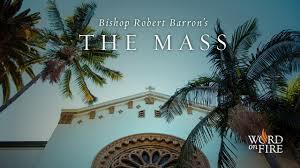 The Mass Video Series by Bishop Robert Barron – Free Event! The Mass will help you understand how to actively participate in the source and summit of the Christian life. Walk through the Liturgy with Bishop Barron and be transformed through insights on this most privileged and intimate encounter with our Lord Jesus Christ. See how the Catholic Mass brings us out of the fallen world and into the heavenly realm, and how it resonates with a call from God and a response from his people, the Church. Most importantly, see how we are intimately joined with the Body, Blood, Soul, and Divinity of Jesus through the Holy Eucharist. Showings will begin on Monday March 4th. There will be two showings of the same material, at 9am and 7pm in the church Hall. Each showing will be one hour: roughly 30 minutes of video then up to 30 minutes of discussion time. We will continue the video series each Monday (same times), ending on April 15th. For questions, please contact Mike Sanfratello (msanfratello@omcsandiego.org) or John Hargrove (jhargrove64@gmail.com).